Handcrafted Precision | Just kidding. Everything's wonky. So close to being done with these. I’m not liking them much anymore. 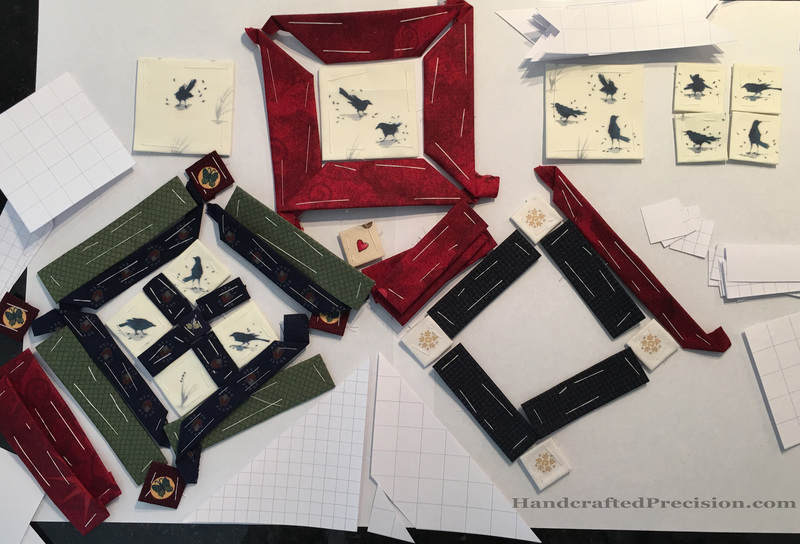 This entry was posted in English Paper Piecing, Hand Sewing and tagged Grackle Party on February 22, 2017 by HP. 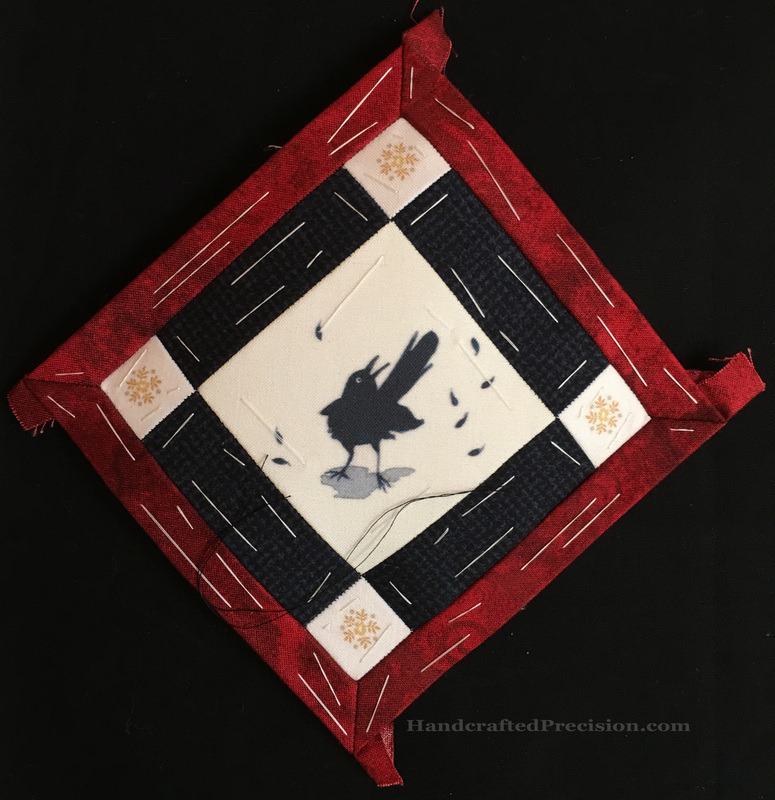 This is every image I could get out of the 8″ x 8″ test swatch I had of this small grackle fabric. 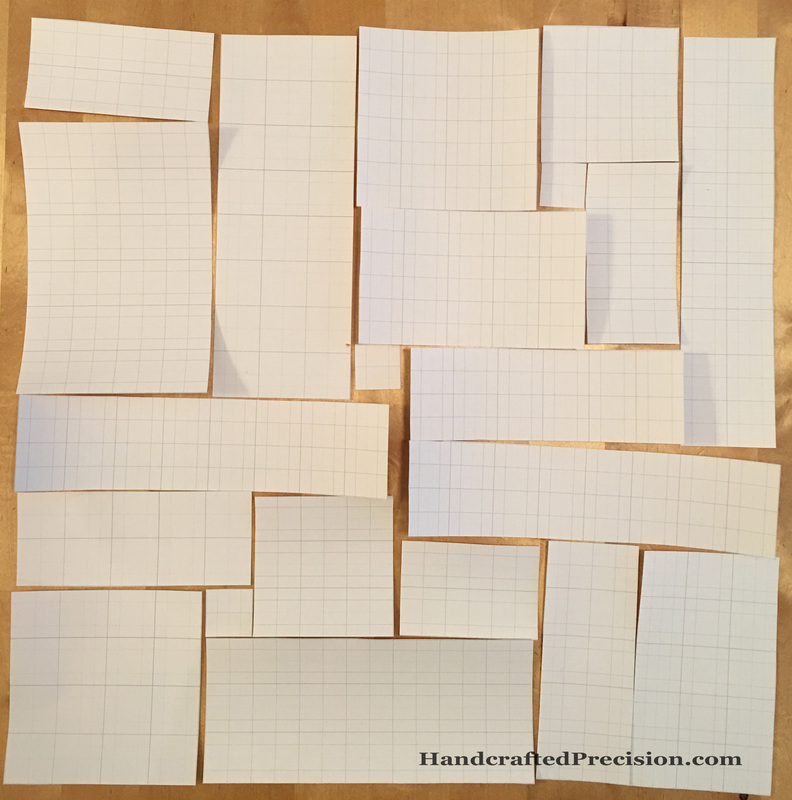 The larger squares are 2″ and the smaller are 1″. I thought I’d make a mug rug or something. Contrast the photos of the layout in this post. 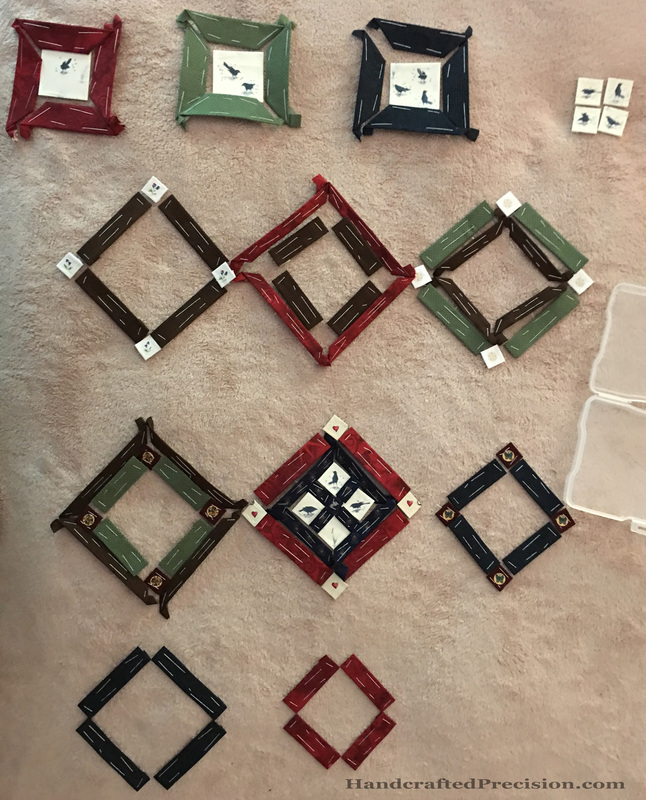 Looking at it now, I could have just spread the found small squares out at the bottom to make them an even width with the top, cut papers the right size to fill in the background and used a very dark blue and bound it in same and DONE, cute little mug rug. But no. I had to get more grackle fabric and on and on. I am the master of scope creep. I’m making good progress, though, so I’m happy. 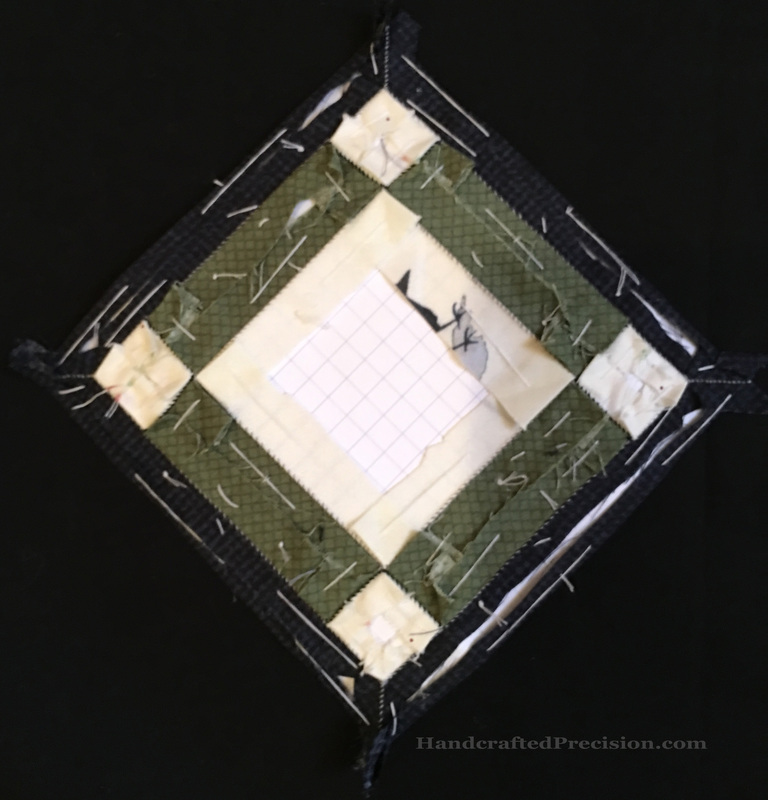 This entry was posted in English Paper Piecing, Hand Sewing and tagged Grackle Party on February 15, 2017 by HP. 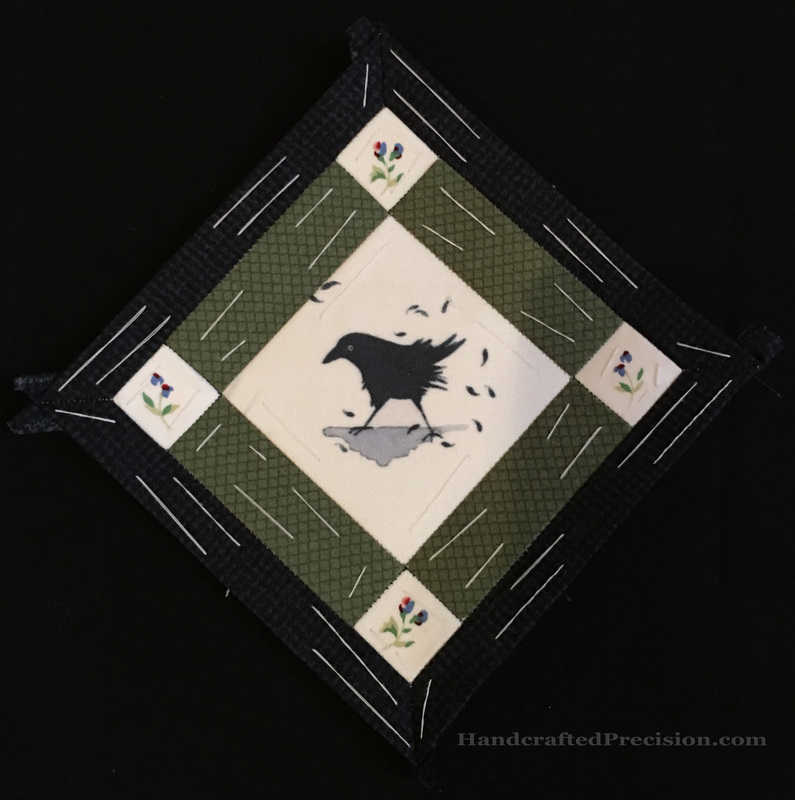 This entry was posted in English Paper Piecing, Hand Sewing and tagged Grackle Party on February 8, 2017 by HP. Those are snowflakes in the cornerstones. No, I don’t care. I have to say that the dark blue crosshatch fabric is growing on me. I got a LOT of it (from my sewing relative, I think) and it just looked old-timey and depressing to me, but now I see a lot of possibilities in it and I think I’ll be sad when it’s all gone. I plan to use whatever’s left over of it in my Stash Bee in RSC colors blocks–the January Hive 8 Cross Roads Block, in particular. 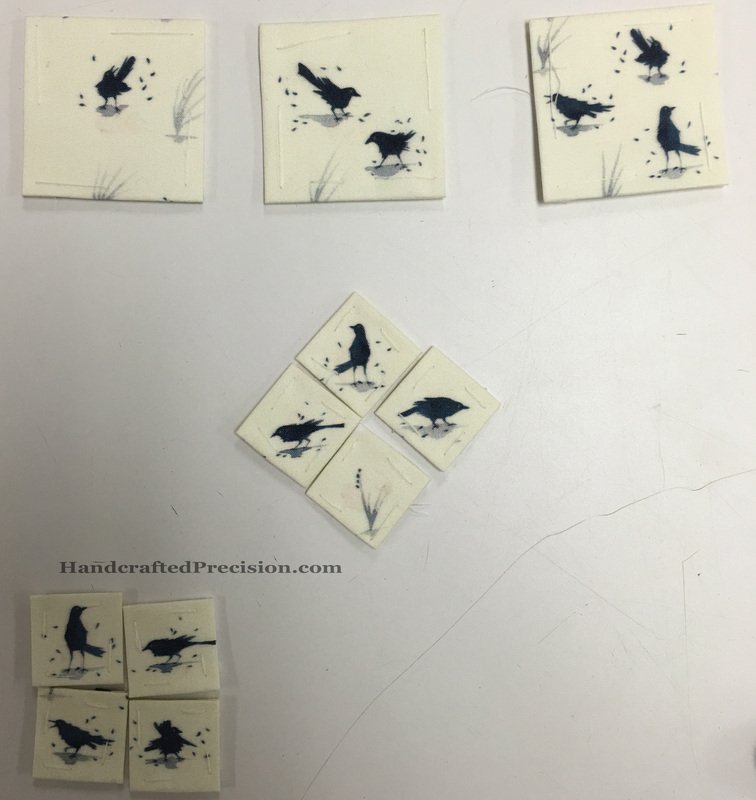 This entry was posted in English Paper Piecing, Hand Sewing and tagged Grackle Party on February 1, 2017 by HP. 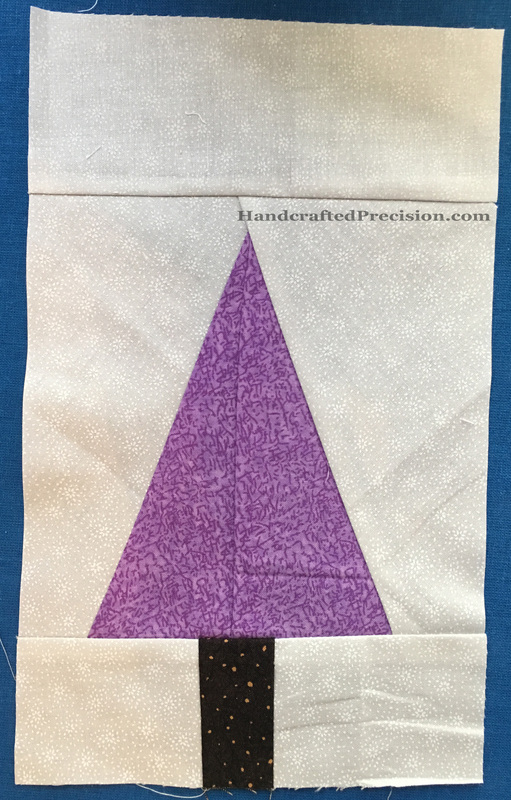 I kept working on my Stash Bee blocks in RSC colors this week and came out of it with two more purple improv trees. I think I’m getting better at it. The tress didn’t take nearly as much background material, though I still ended up with substantial scraps. 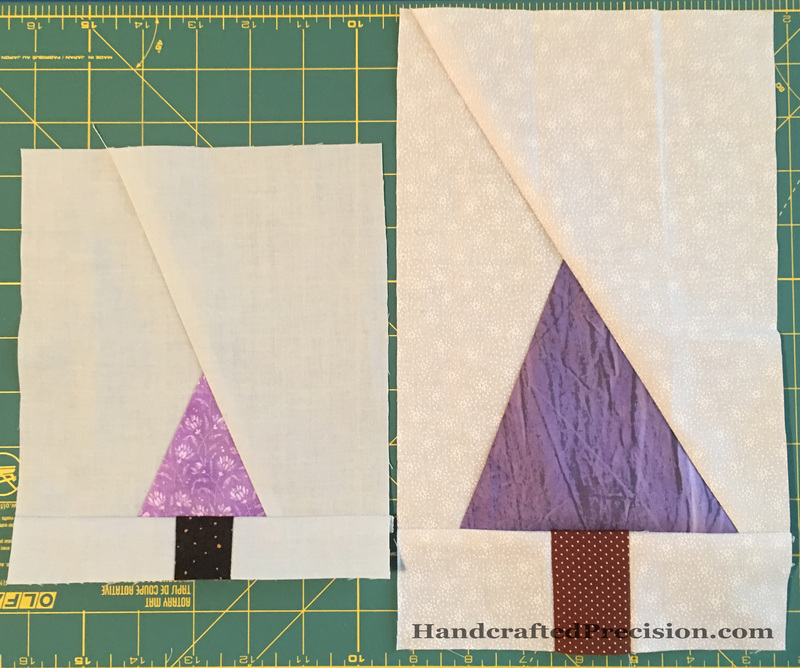 I’m generally happy with these three trees, though piecing them wasn’t a lot of fun for me. I don’t think I’m going to make a quilt of just RSC improv trees. 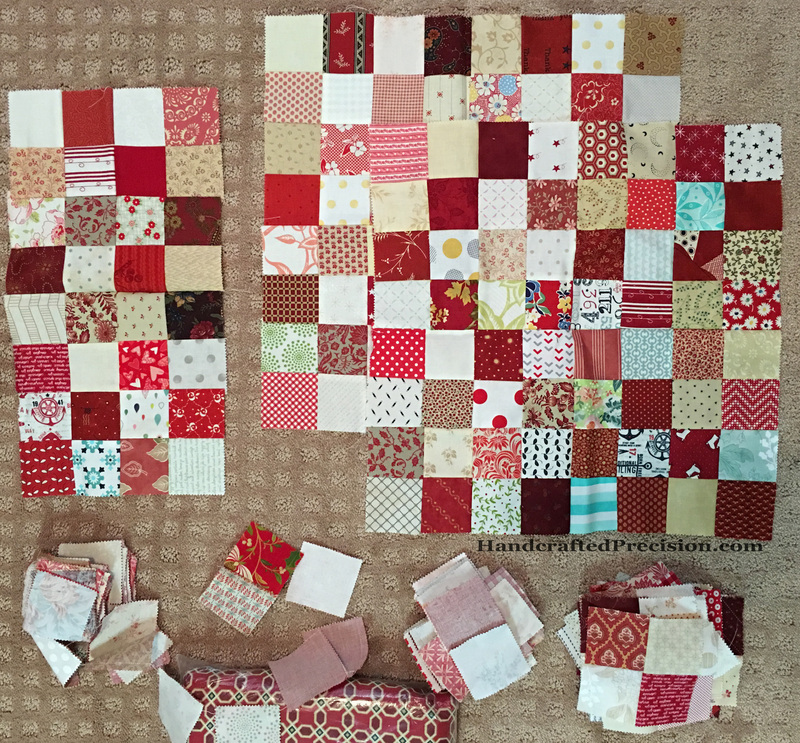 I’m going to stick with my original plan of integrating them into a year-long quilt of improv-leaning blocks from the Stash Bee in the RSC’s colors. I still have another block or two that I’d like to make from this month’s Stash Bee hives, and I’ll probably get one done this coming week, but the other two need more thinking (and possibly a die-cutter). They’ll go on my Project List (see the menu bar up above) under “Someday”. In the meantime, I like my trees! And I can’t wait to see what else will join them. I’m linking up with RSC at so scrappy. 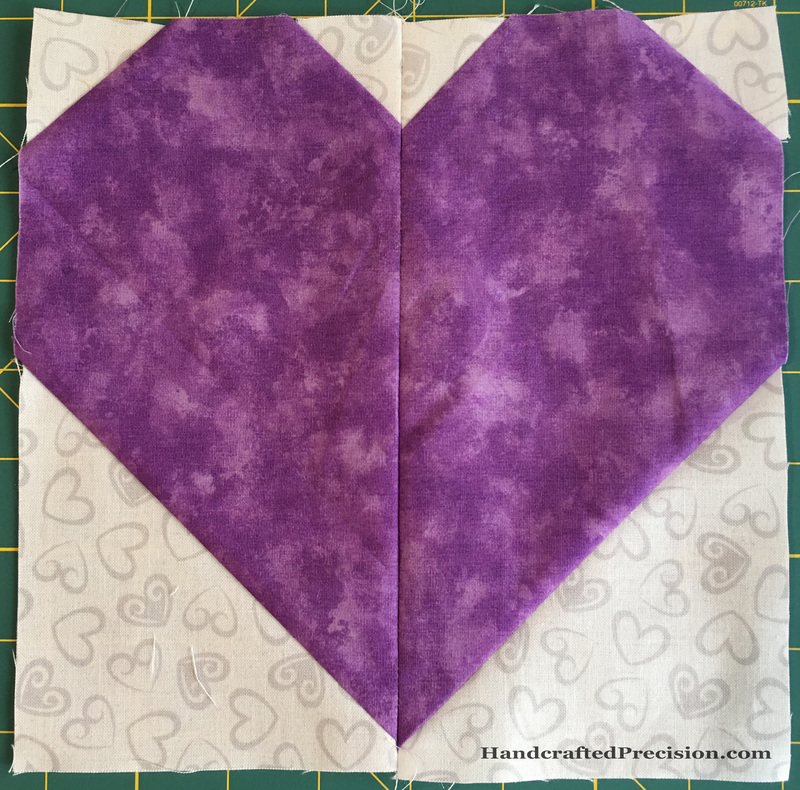 This entry was posted in Machine Piecing, Machine Sewing, Purple and tagged Stash Bee in RSC Colors on January 28, 2017 by HP. I said I wasn’t going to share the backs anymore, but I took a picture of the back, so you get to see it, too. 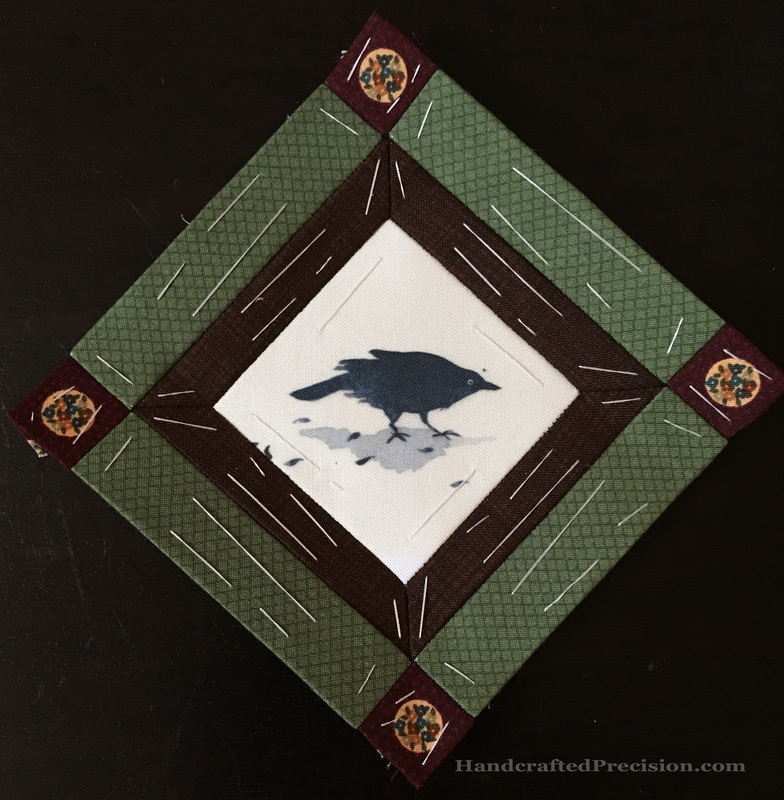 This entry was posted in English Paper Piecing, Hand Sewing and tagged Grackle Party on January 25, 2017 by HP. Let’s talk about Grackle Party. I’ve shared some individual blocks, but not my design for it. Well, design hope, since only the design of the center is really set in stone now. 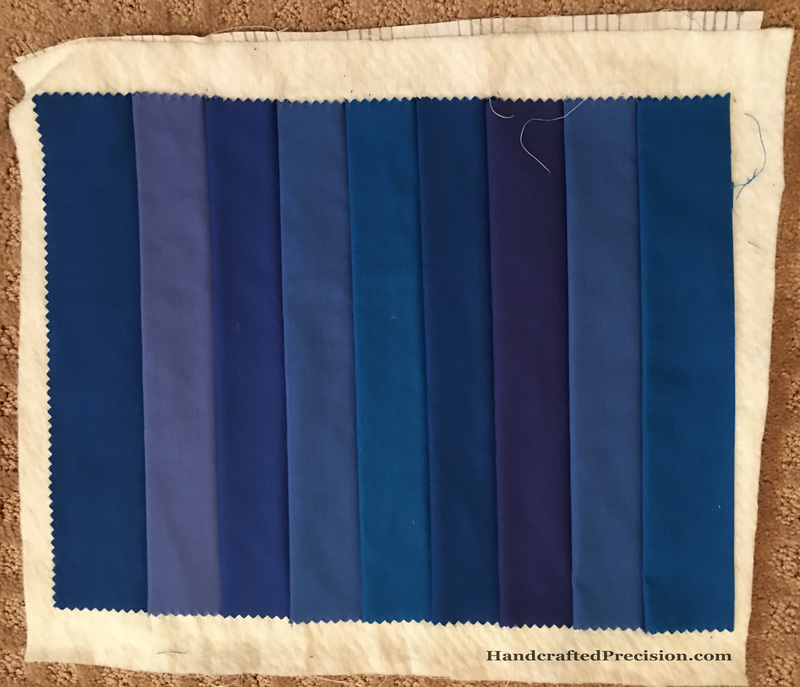 I did talk a little about how it started in this post, basically as a reintroduction to sewing after having my fourth child. Grackle Party is going to be a wall-hanging, though how large it’ll be is still uncertain. I was looking through some pictures from before my move and hope they’ll help illustrate. I went with the center square design and cut more mitered frames in the same size and bigger ones to go around it. 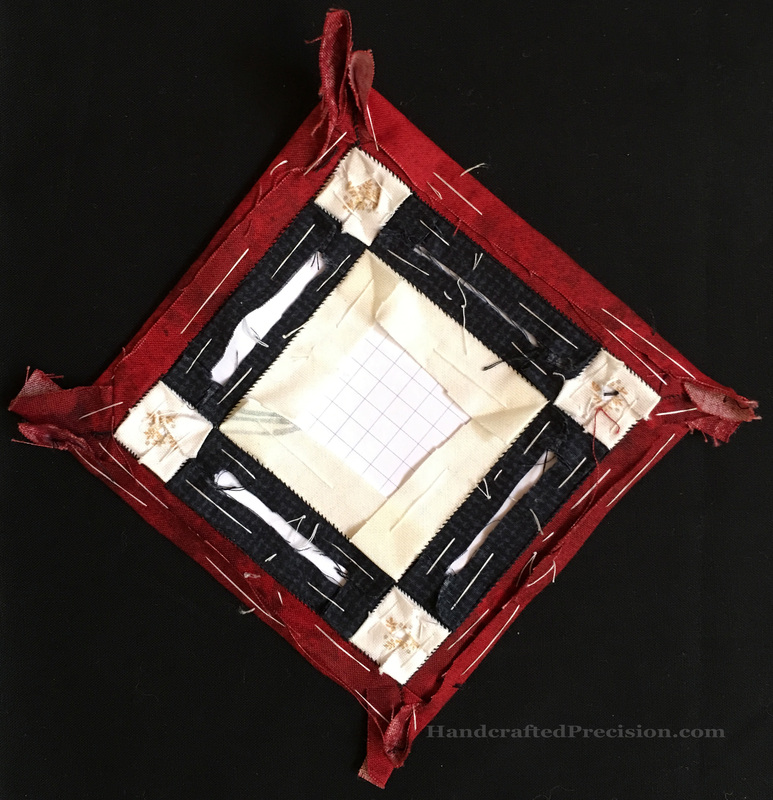 I figured only the center square would have a complicated pieced center, since I really didn’t want to bother with more and it was a good focal point. 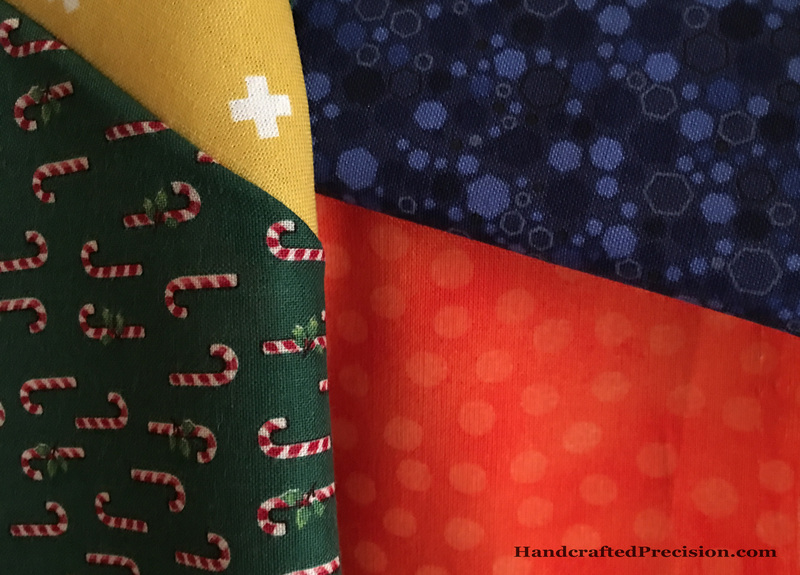 The fabric from Spoonflower also came in a larger print size, which was perfect for the insides of these squares. 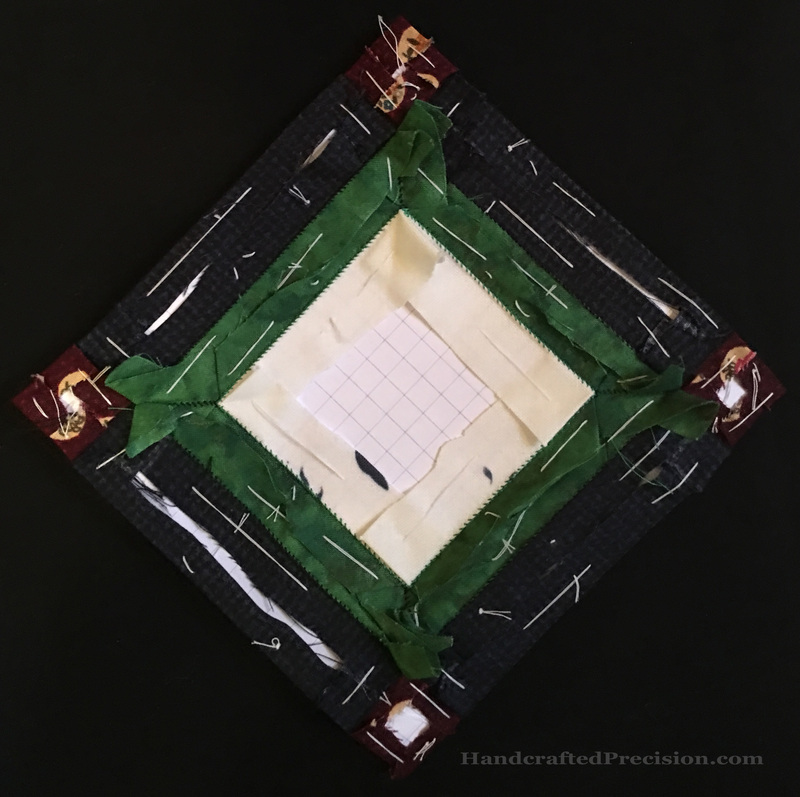 Then I decided that having double mitered frames would look weird and would be too annoying to EPP, so I alternated the mitered frames with straight frames with cornerstones. Below you can see an example of each of the two blocks. On the left is the mitered frame inside. On the right, the mitered frame is outside. The small block above them with the big frame might go into the border. I thought I’d put the bigger framed blocks on point with scrappy neutrals between and then border it with the smaller framed squares, floating in the background. At the bottom, you can see that I was toying with the idea of adding a colored bit in the center of the neutral areas. I’ll come back to that in a future post. The math to make it all fit was annoying, and I didn’t really like the border idea. So, I stopped thinking about the border at this point and put all of those parts away and focused on the center (essentially square-in-a-square) nine blocks. You’ve been seeing those blocks as I finish them, and I have more to show you in the coming weeks, especially if I can find more of the planning pictures form before the move. 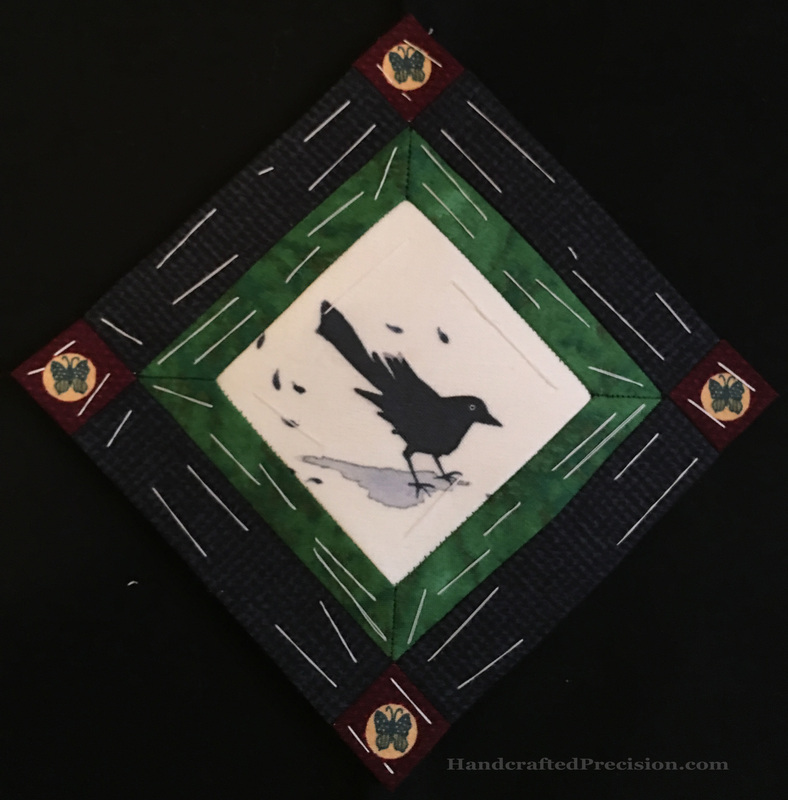 This entry was posted in English Paper Piecing, Hand Sewing and tagged Grackle Party on January 22, 2017 by HP. Today was a dark day for our democracy here in the US. 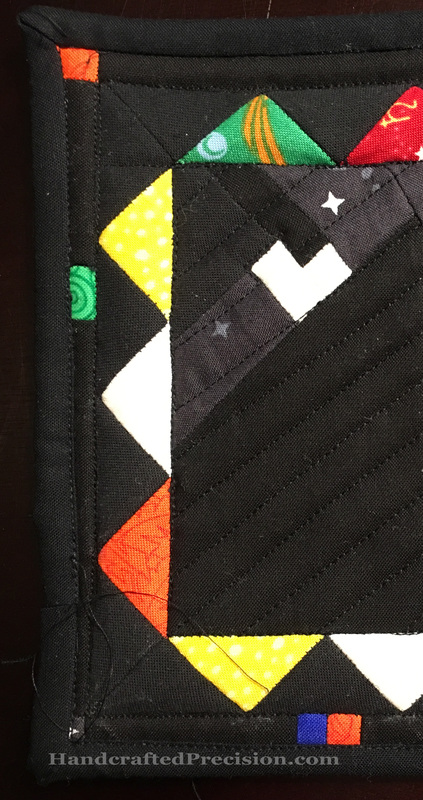 I did some hand-sewing for Grackle Party, which I’m not ready to share yet. I don’t want to associate that piece in my mind too much with this part of history. 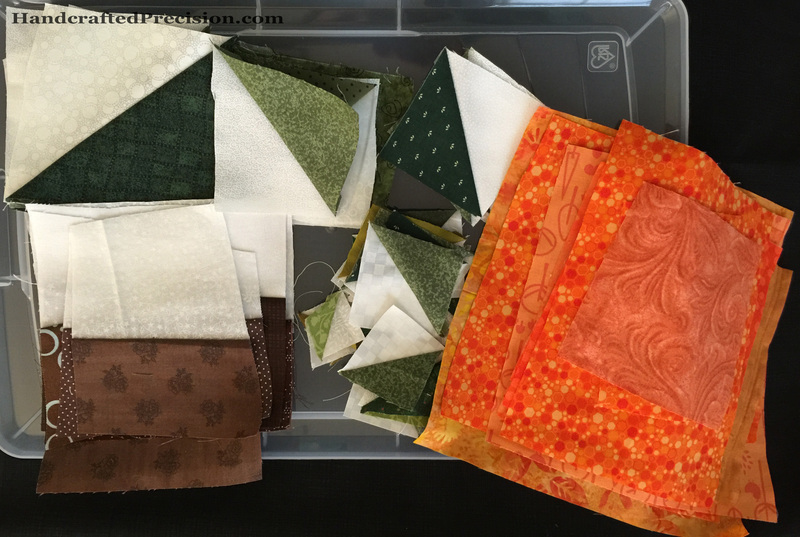 A few days ago, I did my first Stash Bee blocks in that month’s Rainbow Scrap Challenge (from soscrappy) color. January is PURPLE. 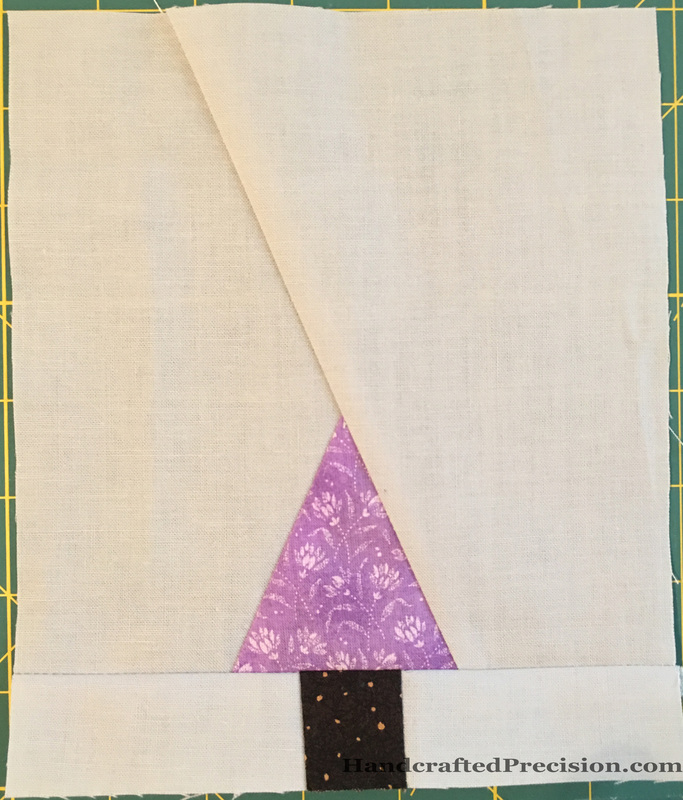 I didn’t quite hit the final measurement of 8 1/2″ square, mine’s more like 8 1/4″, but it’s close enough for an improv-ish block. It wasn’t supposed to be improv, but it’ll likely fit better with the improv blocks than the more traditional ones. 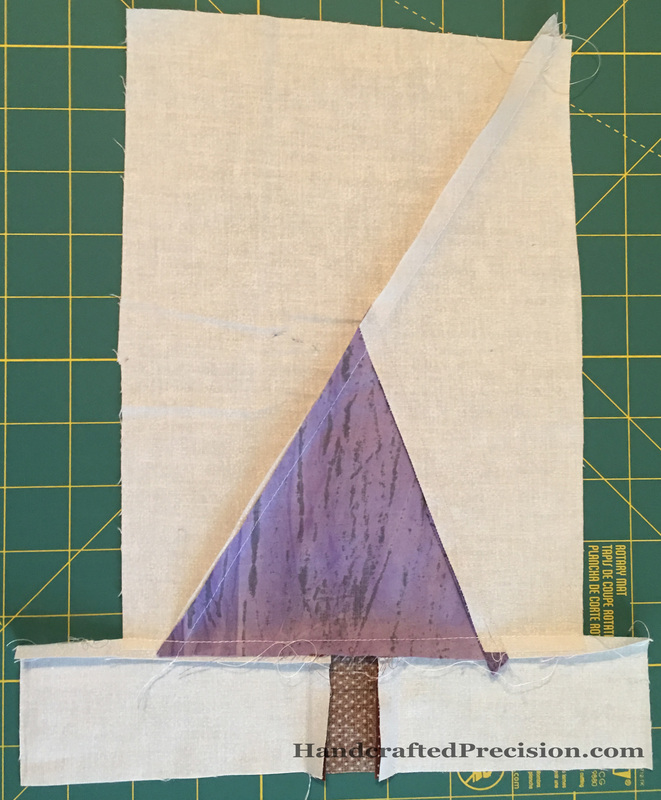 I also learned that I need WAY more light in my sewing area to cut accurately. I didn’t even bother with her width and height requirements and my top’s uneven, but I think I nailed her look. 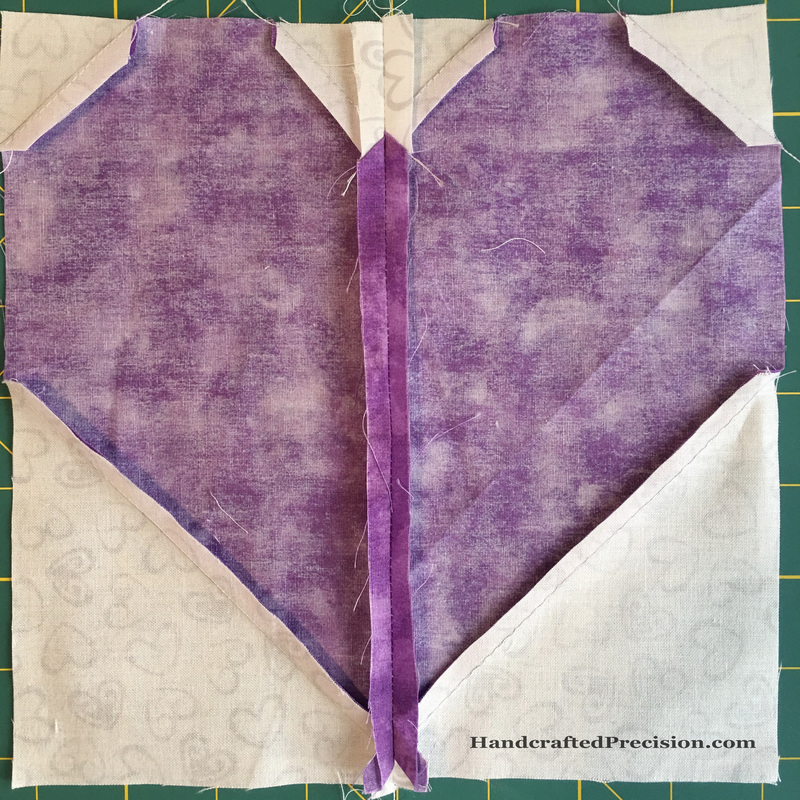 I enjoyed this one so much (though it had a steep learning curve for me) that I have trunks cut and pieced and purples pulled for two more blocks. It was a mess, but I think I understand better how the angles go together now. The back’s less of a mess than the front, amazingly. I did press after each seam, which helped. 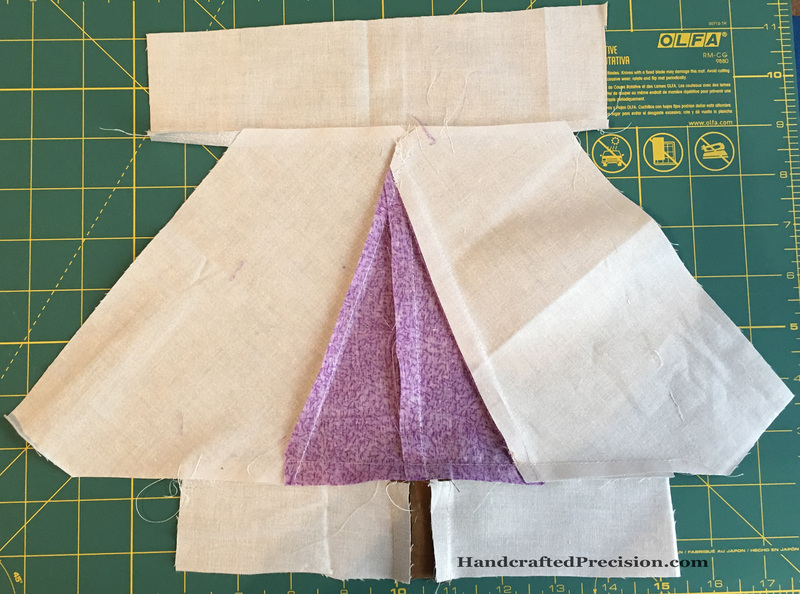 Unfortunately, the purple fabric’s been in storage for a LONG time and I could not get that crease out. 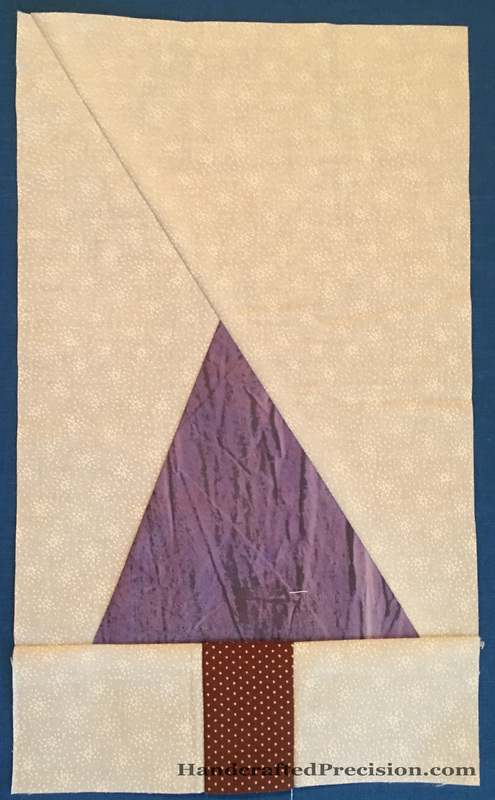 This entry was posted in Machine Piecing, Machine Sewing, Purple and tagged Stash Bee in RSC Colors on January 20, 2017 by HP. For a more complete list of my WiPs, look above my header image at the “Project List” link. That list is a work in progress, too. The Star Wall Hanging on black, for my mother. Two more years and it’s still not done yet. Argh. Tiny Flower Garden for Prim. It’s a lot more done now than it is in this picture, and I have more pictures of its assembly which I have yet to blog. 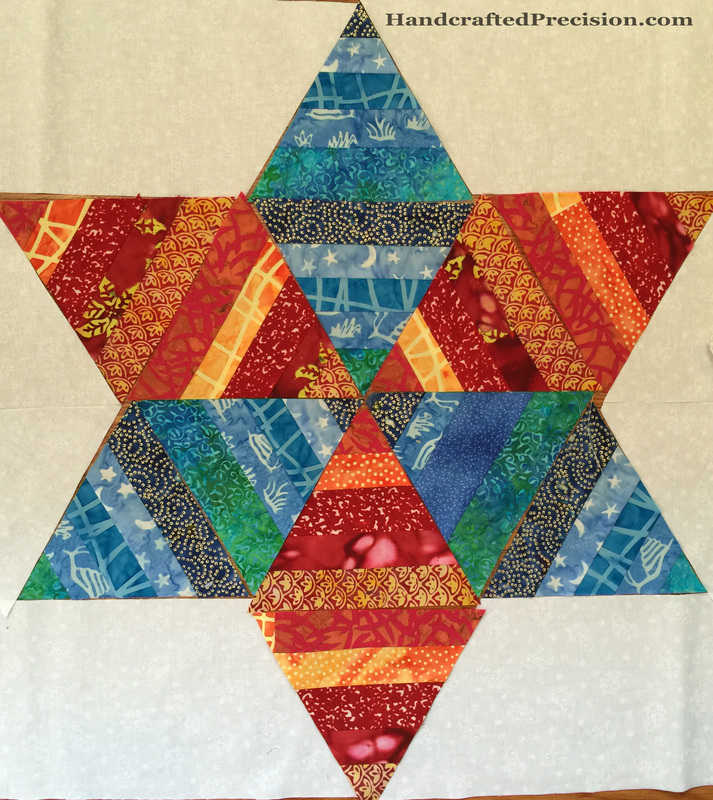 I think if I really push, I can get it quilted and bound and ready for hanging in under three months. I’m dreading the applique to the borders, but I think I’ve done enough hand-sewing by now that it’ll be fine. I have no idea how I’m going to quilt it beyond “simply”, but I’ll cross that bridge when I get to it. 3. Pumpkin Patch for Sec. I’d decided that this would be a twin-sized quilt, but I’m going back to my toddler-bed-sized plan. It’ll be a faster finish and he’s not super-into pumpkins anymore, so this can go into storage for someday when he moves out and takes it with him. Or he can use it on the couch. Or both. 4. Red and white twin-sized bed quilt for Sec. Not blogged (or named) yet, I’ll add a link when I post about it. 5. 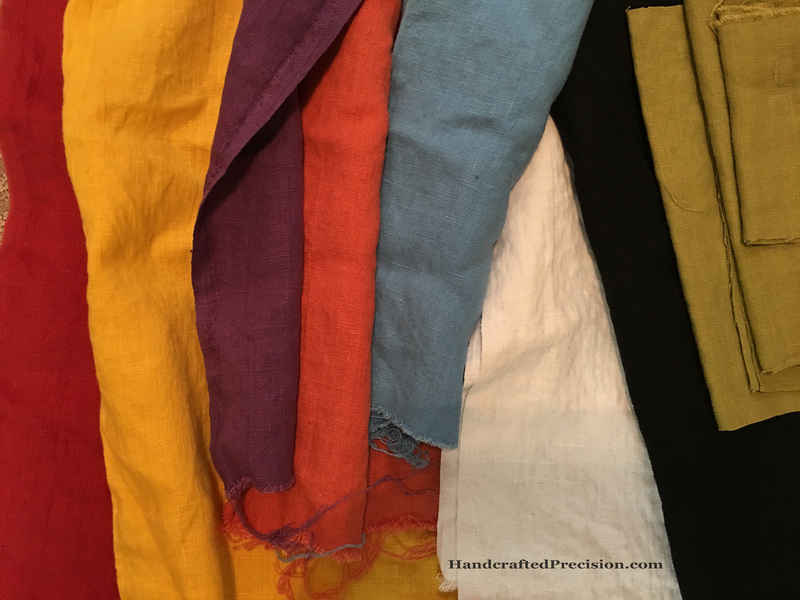 Improv linen throw quilt. Chunky rectangles of color, accented with black and white. 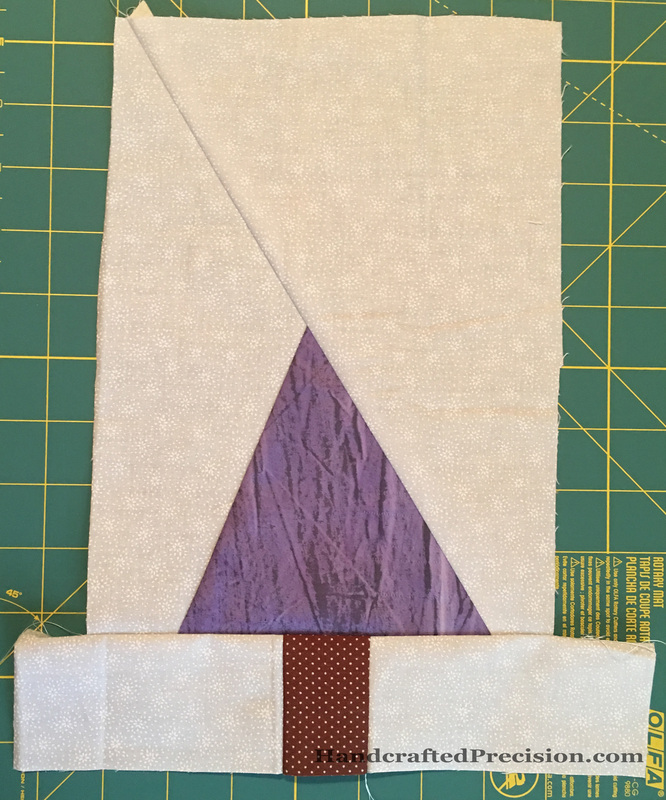 1/2″ seams, not blogged yet. 6. Toddler placements. I promised these to the kids’ (old) school, and I’d like to get them finished up and mailed. Not blogged yet. 7. 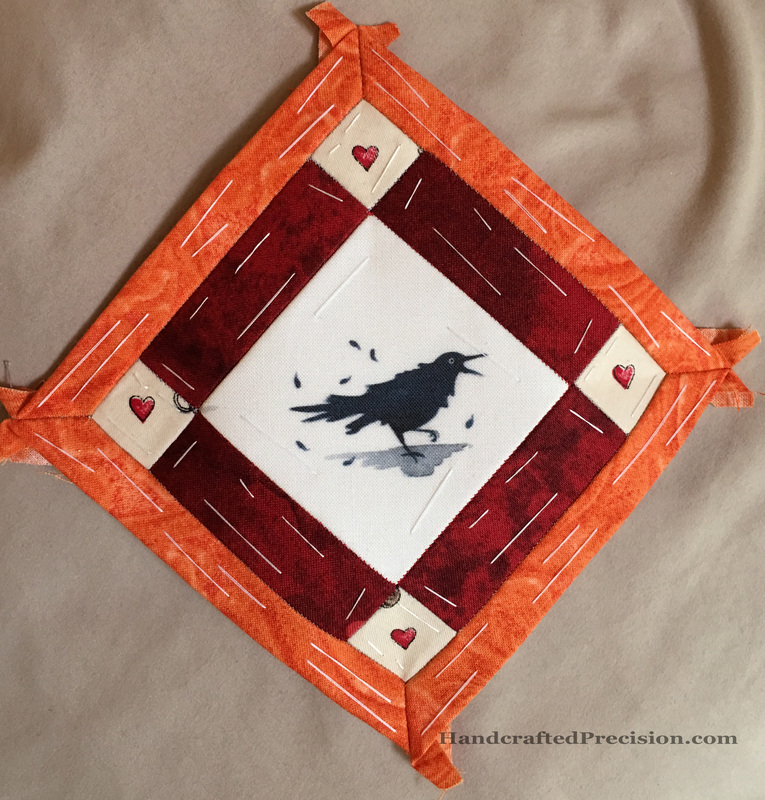 16″ square epp pillow cover. It’s currently just paper shapes, not blogged yet. 8a-d. Four 7.5″ x 8″ drink/snack mats for the kids’ new drink station. These are EPPed and I’ll have to redact the photos, since each features its owner’s first initial. I have Prim’s ready, but I need to re-do the binding as I rushed it and it’s not great. The paper for Sec’s is cut out and I’m in the basting stage. These are four separate projects, since they’re time-consuming, but they’re part of a series so I’m listing them together. Not blogged yet. 9. Four 7.5″ x 8″ alternate drink/snack mats. 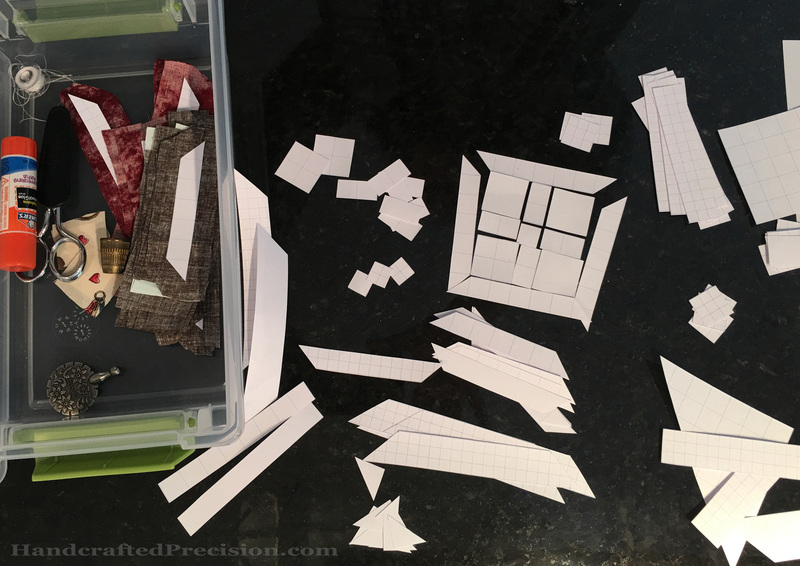 These will be machine-pieced and are much simpler, so they count as one project. 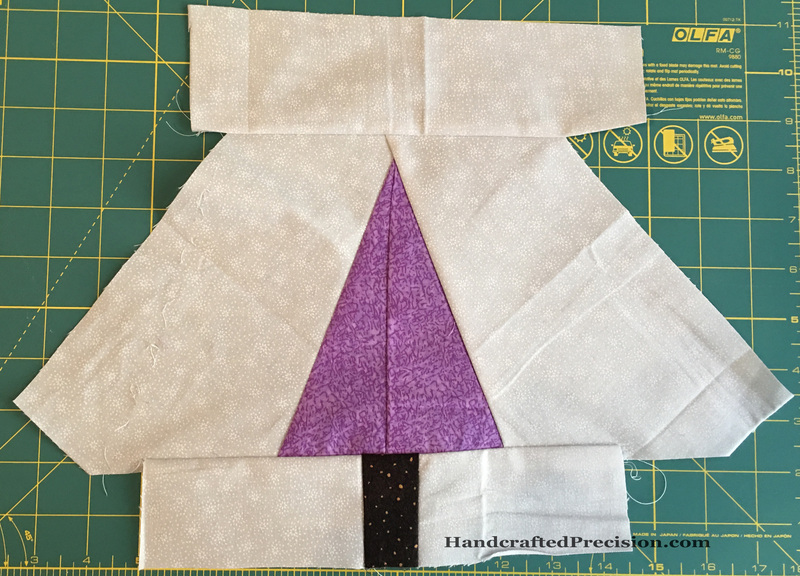 I have the top of Prim’s sewn together and Sec pulled fabrics for his, but that’s about as far as I’ve gotten. Not blogged yet. And I’ll leave it here, since I don’t want to miss the link-up for the first quarter. I’ll keep updating my “Project List” link, since I’d like a master list of my WiPs to work from. Linking up to the Q1 2017 Finish-Along. 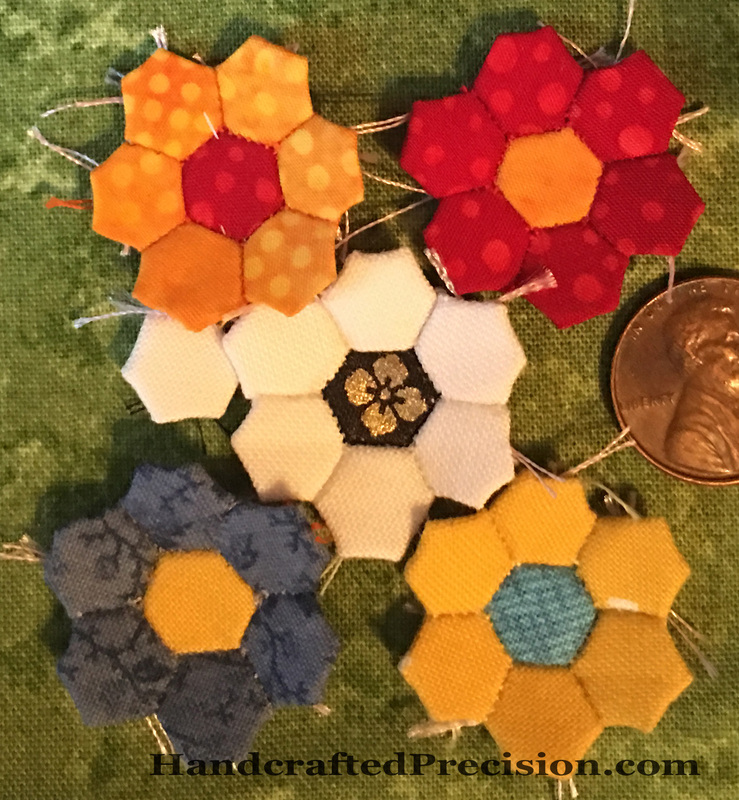 This entry was posted in English Paper Piecing, Grandmother's Flower Garden, Hand Sewing, Hexagons, Machine Piecing, Machine Sewing, Meta and tagged Pumpkin Patch, Star Wall Hanging, Tiny Flower Garden on January 12, 2017 by HP. Terrible low light photo ahoy! Four minuscule hexagon flowers done, and after taking the last photo on the light background, I realized I liked it much more than the bright green I’d used to baste some of the hexagons. But now seeing the flowers on this more muted, olive-y green, I like it more then the white I’d intended to use as the path. But I already basted and sewed most of the background together and I used one of the few flowers on black I have in the center. A cascade of “buts”. I”m thinking about just stuffing this one into a container with this green and a strip of white and coming back to it later. It’s just not fun sewing these little things together anymore and I’d like to make progress on my other projects. We’ll see if that’ll stick. 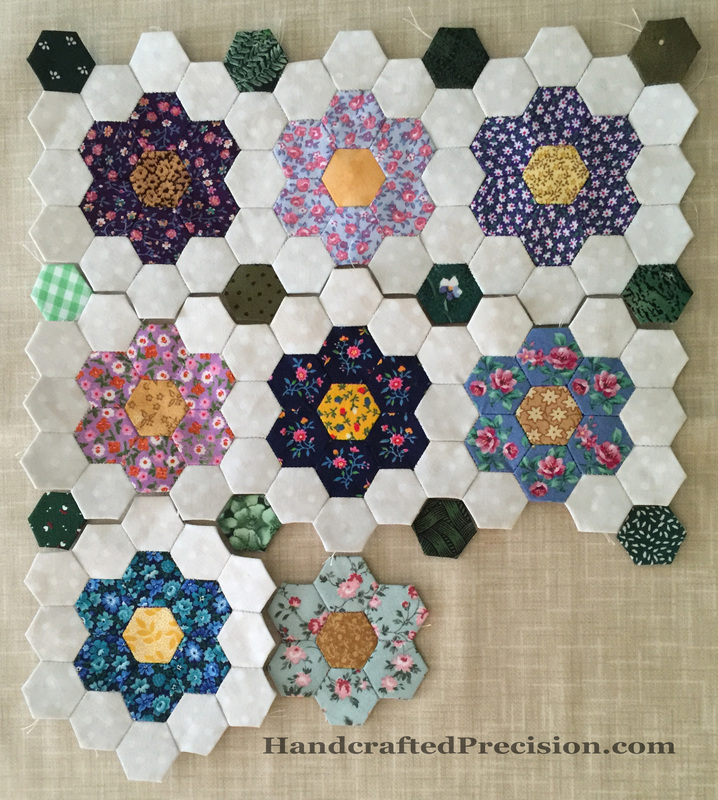 This entry was posted in English Paper Piecing, Grandmother's Flower Garden, Hand Sewing, Hexagons and tagged Minuscule Hexagons on January 7, 2017 by HP. No Pinterest or other "sharing" or "bookmarking" sites, please.